DC area production fans get ready. 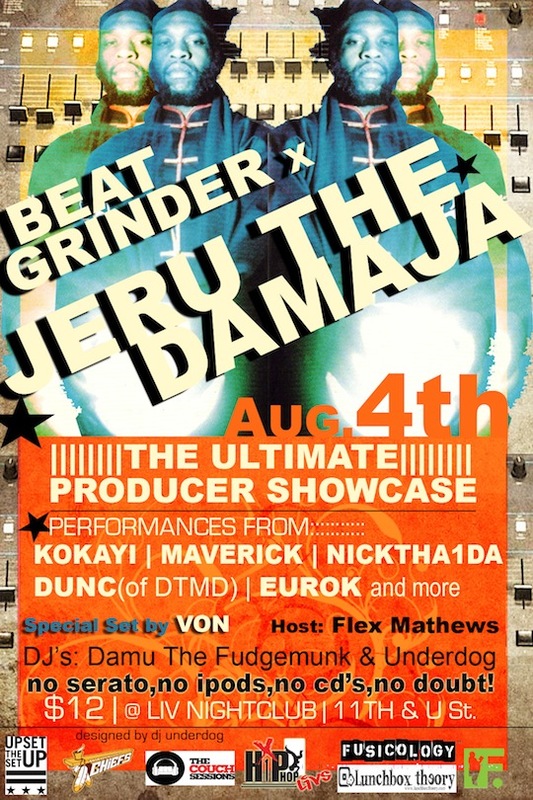 The Beat Grinder producer showcase returns with featured guest Jeru The Damaja. With Damu The Fudgemunk and DJ Underdog manning the turntables, the event will showcase the talents of DC producers Maverick, Kokayi, Nick tha 1da, Dunc (of DTMD), Eurok and more. you can tell I haven’t bought a rap album since 1996! haha join the club.. although I got jeru’s album. But i bummed it off a him hah. Damu back doing shows. I used to see him in the streets of DC zoning out on beats. Glad to know he is still kinda active. Guess the wax dust is getting to him. Shout to the cats that still keep it true without fail. DC not DMV ! Damu and Jeru should do an album. DAMN. Big shout to the homey KOKAYI, did a battle with him for Culture Shock 3, son brought out his phantom! heat!